In April 1998, my wife Denise and myself fulfilled a long held ambition when we flew from Melbourne Australia, to Istanbul in Turkey, so that we could attend the special Anzac Day service upheld each year at Anzac Cove, at the spot where Australian and New Zealand troops had waded ashore to tackle the Turkish troops, on the 25th of April in 1915. It was at this site, that the legend of ANZAC had its birth, the word being formed from the first letters of Australian New Zealand Army Corps. From Istanbul you need to undertake a five hour bus trip to Ecebat on the Gallipoli Peninsula, then cross by car ferry to Cannakkale, for an overnight stay. This part of Turkey on the eastern side of the Dardanelles, sits on the cusp of Asia. Because of the burgeoning interest both by Australians and New Zealanders to visit the battlefields on Anzac Day, (only 300 people attended here in 1994, and this year's attendance was reported to be 8,000) it is necessary to be aboard your bus, ready to cross the Dardanelles, and driven onto the car ferry leaving the Asian shore no later than 2 AM. Whilst on this ferry, it was certainly a mistake to make use of a very primitive and overpoweringly smelly toilet, people forced to use this facility just exited it, looking quite pale and decidedly unwell. On the actual Gallipoli Peninsula, only very narrow roads exist, and when invaded by literally hundreds of buses all looking exactly the same, chaos becomes the order of the day. The only safe way to distinguish one's bus is by recording its number plate, but all your fellow passengers will not cope with this task, so much patience is required whilst we wait and wait for someone to find this particular bus again. Once again the toilet facilities are most limited and very primitive, when you manage to track one down, there will be a huge queue. At last you are able to enter, and then you just wish you had not been so lucky in actually finding it. The safety of suitable undergrowth is definitely preferable and highly recommended. 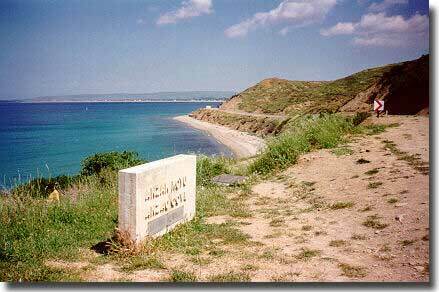 Our bus arrived at Anzac Cove at 4.30AM, this is but a tiny beach lined with grey sand, and smallish rounded stones. The waiting throng already crowded out this area. The Cove nestles below the narrow road winding above it, then the dark forboding hills rear up above that road. Denise and I quickly assessed the situation, if we were to see anything of this Dawn Service, we would need to start climbing the very hills that our Anzacs had faced so long ago. Encumbered by heavy overcoats, bought back home specially just to wear this morning, and of an age much advanced on those young Diggers, here we were in total darkness, there being no visible moon, and we now approached this rather daunting task. We stumbled into gorse bushes and stunted and prickly holly trees, and now and then suddenly disappeared into old concealed shell holes. But perseverance at last won out, we had climbed high enough to view the total area below us. So we sat, huddled in our coats, somewhat smug, having in a small way emulated our forebears. We did not have to tote a heavy pack, a rifle, plus ammunition, water or all the accoutrements of war, nor were we soaked to the skin through wading ashore to arrive on a hostile shore, or be shot at by the Turks, dug in on the heights overlooking these hills. Dawn broke but slowly, and washed over Anzac Cove, to the plaintive lament played by a piper, a New Zealander, Private B.D.Walshe The New Zealand Governor General gave the main address, and our own Minister of Immigration & Multicutural Affairs, the Honourable Philip Ruddock, read the lesson. The Last Post, a Minute's Silence, then the Reveille played by buglers echoed across the gullies, and drifted out over the Dardanelles, the National Anthems of both Australia and New Zealand were sung to bring to an end another Dawn Service in this sacred place, located deep inside Turkish Territory. We scramble down from our hillside viewing spot. Descending from our eyrie was a great deal easier than our ascent in total darkness, in fact we were rather proud of ourselves to have managed that climb, and were happy to have taken the decision to "go for it." We now proceeded in our bus to Cape Helles, on the Southern tip of the Peninsula, to attend a service at the huge Turkish Memorial, the Turkish army and their officials all taking this occasion very seriously. By noon we were back above Anzac Cove at the Australian Memorial situated at Lone Pine. This is the area for Australia's main Gallipoli Memorial. It reveres the 3,268 Australians and 450 New Zealand troops who have no known grave, plus the 960 Australian and 252 New Zealand soldiers buried at sea. In April of 1915, a single Pine tree grew on this site, the Aussies named it Lonesome Pine, but it was destroyed in the subsequent fighting. Some gathered seeds were brought back home to Australia, planted, nurtured, and used to grow this present tree here in this cemetery. A huge crowd had gathered, many young Australian back packers converge here on Anzac Day from all over Europe, answering the inanate urge to be present here at Gallipoli on this special day, just as we did. A moving and most appropriate address was given by Philip Ruddock, followed by a Minute's Silence, observed to the letter, not a sound, just eerie silence. I was very aware of my own heartbeat as each of us, in our own way, recalled the ultimate sacrifice of so many, so long ago, and those who have since died in the cause of freedom. I felt very emotional, and my mind rushed back to the night of August 9 1942, when HMAS Canberra was sunk and we had 84 crew members die. To wind up this ceremony, the very robust singing of Advance Australia Fair by the assembly is a memory we both will carry with us always. Casualities, 28,150, including 8,709 dead, that headline in the media today would evoke a furore. 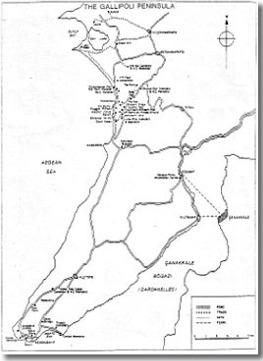 But that was the end result for Australian Troops involved in the abortive Gallipoli Campaign which dawned on the 25th. of April, 1915 and lasted until the evacuation during December in that year. The removal of Allied troops from the Peninsula, may be described as the single success in that wholly disasterous and ill planned operation. At the time of this landing, Australia as a Nation, was but 14 years old, our population less than 5 Million, when one combines the losses at Gallipoli with those on the Western Front, about 60,000 Australians died overseas in WW1, a whole generation wiped out. Who can judge what they may have achieved if they had lived? How do you guage what all those deaths meant to Australia as a whole, particularly in small country towns across the country, where so many men did not return, and to our major cities, when so much potential talent was squandered and lost through the utter futility of war? Mustafe Kemal Atiturk who Commanded the 19th. Turkish Division at Gallipoli,and became the first Turkish President, wrote these words which appear on a fine Monument mounted on the Peninsula ---- "You the Mothers, who sent their sons from far away countries, wipe away your tears, your sons are now lying in our bosom and are in peace. After having lost their lives on this land they have become our sons as well." To make this pilgrimage, was both a wonderful and memorable experience for both Denise and myself. At different times whilst visiting the many cemeteries, we did shed quiet tears. One is shattered by the young ages of so many of these original Anzacs, only 15, 16, 17, the youngest but 14, cut down before they had time to become men, and really commence their lives. Should you visit Turkey, and its capital Istanbul, as my wife Denise and I did en route to Anzac Cove in 1998, you would be suprised at the number of Statues, Busts, Posters, and Photographs of a stern looking man featuring quite fierce mustachios, who is he? None other than Mustafa Kemal Ataturk, without doubt, the Father of Modern Turkey. Born in 1881, he was named Mustafa, it was his mathmatics master who gave him the nickname of Kemal, "The perfect one." Ataturk joined the army at a young age, then at Gallipoli as a Colonel, he was in command of the heights that overlooked the territory that Australian and New Zealand troops invaded on that memorable 25th. of April in 1915, when the name of ANZAC was born. Ataurk was basically responsible for the ensuing Turkish victory. Post first war, when Greece invaded Turkey over 1921/1922, it was Ataturk who led the Turkish army to another great victory. For centuries, Turkey was part of the Ottaman empire, and the Sultans ruled until the end of WW1. In the mid twenties, Ataturk was coming to power, and he gave himself the task of modernising his backward country. The introduction of a Westernised alphabet, he ensured that books, newspapers, and street signs etc all used the new script. He packed his blackboard and chalk, and stumped throughout Turkey, teaching this new alphabet. A justice system based on western justice was instituted, setting aside the old laws. 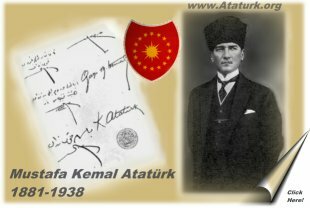 Ataturk ordered that girls ( hitherto forbidden ) should be allowed to attend school, and gave equality to all women, unheard of under Ottaman rule. In 1923 Ataturk proclaimed the Republic of Turkey. He believed in a less dominated religious life for all his people, ie, a non secular or non religious way of daily life. He would only tolerate one political party, his own, and woe betide any factions that openly disagreed with his politics. He was a tough and powerful leader. It was Mustafa Kemal Ataturk who literally dragged Turkey, kicking and screaming into the 20th. Century, and he may surely be regarded as the "Father of Modern Turkey." Ataturk had in 1923 become the First President of the Republic of Turkey, died in 1938. He left his distinct imprint on his country, which is still very evident today. http://www.greece.org/genocide/quotes presents a quite different view of the legacy of Mustafa Kemal Ataturk.